The mark of every great editor is a full understanding of the tools at their disposal—and the ability to use those tools to their full potential. And few tools are as important and nuanced as those that affect color grading. If you’re a Premiere Pro editor, today I’m going to give you a decidedly comprehensive deep dive into Premiere’s Lumetri Color Panel. Prepare to take a few more steps toward greatness! The Lumetri Color Panel is found in After Effects and Premiere Pro. To use its tools to the max, we’ll dive into the hidden secrets and lesser-known corners of the panel. We’ll work on a wide range of problematic footage, using advanced techniques. I’m assuming you have at least a basic understanding of color correction concepts and terminology, and know your way around scopes. If you don’t, you might want to read up on color correction basics, as well as how to read scopes. The knowledge you get in this article will make you a color grading ninja without ever leaving Premiere/AE. Let’s start with an overview of the Lumetri Color Panel itself. If you’ve been using the panel for a while and know how the controls work, you might want to skip directly to some of the other sections, linked above. Think of the Lumetri Color panel as a remote control for the Lumetri Color effect. Whatever you adjust in the panel affects the corresponding settings in the Lumetri Color effect. You could do the exact same adjustments in the Effect Controls panel, but the controls in the Lumetri Color panel are much easier to adjust, and they’re always available in the same place. The Color Workspace in Premiere Pro is a good starting point for color grading in Premiere. It reveals the Lumetri Color Panel to the right, and can show the Lumetri Scopes panel to the left of the Program Monitor. Swan footage courtesy of Vidar Granberg. The Lumetri Color panel (and the effect itself in the Effect Controls panel) is divided into six main sections with somewhat overlapping functionality. So, whatever image processing or video editing software you’re coming from, you should be comfortable working in at least one of them. We’ll take a closer look at each one. The six main sections of the Lumetri Color panel. It used to be that Lumetri was a huge resource hog, and calculated all the sections even if you hadn’t adjusted anything in them. In my book “The Cool Stuff in Premiere Pro” I recommended that you turn unused segments off to save computer resources. I even did this in all my presets. This has changed, so now the sections you haven’t adjusted are just bypassed. This is great news! This first section of the panel is based on the well-known (at least for still photographers) panels in Lightroom and Adobe Camera RAW, so it’s easy to get started. This is where most people work when they do color grading. Most of the sliders are pretty much self-explanatory, but a couple are worth specifically addressing. Input LUT: This is where you add your technical LUT to get your footage into the Rec. 709 color space (more on technical LUTs below). If your footage is shot in Log or with some custom camera settings, you can add an Input LUT before you start adjusting the controls. This will make the image look “normal”, and the sliders will work as expected. Note that the Input LUTs that you apply here are applied before all the sliders and other controls. The HDR White slider is not active until you choose High Dynamic Range in the panel menu. The White Balance Selector (the eyedropper) can help fix the white balance in a clip. Click it and then pick an area in the picture that’s supposed to be white. Ctrl/Cmd-click to sample the average of 5×5 pixels, instead of just clicking, which will sample just one pixel. This will give you a much better representation of the color, as there will always be small variations in the pixel values due to noise and compression artifacts. The eyedropper will get a little fatter when you press Ctrl (Cmd) to indicate that it will sample a larger area. The White Balance part of the Basic Correction section. I often have trouble finding a perfectly neutral area in my footage, and I find that I get better results when I tweak the sliders manually. On some clips, mainly when you have some obviously white areas, it will work just fine. This light house had a warm cast. After clicking on the light house with the White Balance eyedropper, the light house got a neutral white color. Other times, the White Balance Selector will mess with the black levels, introducing a color cast in the shadows. As you’ve probably guessed by now, I don’t use the Auto White Balance Selector too often. When manually tweaking the sliders for a white balance, adjust the Temperature slider first until you get the red and blue levels the same. Then, adjust the Tint slider until the green matches the two others. There’s a reason for the order they have in the UI. Under the White Balance controls, you’ll find the Tone sliders. They should be very easy to understand. They control exactly what their names indicate. The HDR Specular slider is grayed out until you choose High Dynamic Range in the panel menu. The Tone sliders in the Basic section. Please note that adjustments to the Whites and Blacks sliders are applied before the other sliders, even though they’re placed at the bottom of the stack in the UI. More on that in the Color Science section. The Look drop-down menu is where you can apply the LUTs that you put in your Creative folder (see below). You can choose a LUT from the drop-down menu, or browse them using the arrows pointing left and right, and then click the preview thumbnail to apply the LUT. If your favorite look is not in the list, click Browse and point to the folder where you keep it. The preview you see in the thumbnail shows the LUT applied to the original footage, ignoring other adjustments you’ve done to it. So, what you see in the thumbnail isn’t necessarily what you get. This is confusing, and I don’t like the way it works. The Faded Film raises the blacks and lowers the whites for a duller look. The Vibrance slider adjusts saturation, but avoiding the already saturated pixels and skin tones, to avoid over-saturated colors. I like to use the Vibrance slider to create a desaturated look. I think it does a better job for this than the standard Saturation slider. Overall, I don’t use this section much. I mostly use it when I need to adjust the Vibrance or when I apply a look/LUT to an adjustment layer. This section is disabled when you set the panel to HDR. This is my favorite section! When I don’t have a control surface, I do most of my adjustments here. Combined with the RGB Parade scopes, the RGB Curves is a very intuitive way to do color grading. As with other controls in Lumetri, just double-click to reset the individual curves. Surprisingly you can’t reset all of them with one click since there’s no Reset button. There are Reset Parameter buttons for RGB Curves, Hue Saturation Curves and the whole Curves section in the Effect Controls panel, though. See my article on Advanced Curves Techniques for lots of cool techniques you can use when grading with Curves. This section will probably be the most familiar one if you’ve done color grading in other NLEs. With the three-way color correction, you can adjust the brightness, hue, and saturation for shadows, midtones, and highlights independently. This is also where you find the new Color Match feature and a button to toggle Comparison View on and off. All the adjustments from the Color Match feature are done in this section. To adjust the shadows, drag the cross in the center towards the color tint you want—or away from the color you want to remove. To make the shadows darker, drag the slider down, and drag it up to make the shadows lighter. The controls for midtones and highlights work the same way. The Color Wheels & Match section. The color wheels give you great feedback to show you what has been adjusted (by you or by the Color Match feature). The wheels get filled when they’ve been adjusted, and the sliders get blue. So, in the figure here, we can see that I’ve adjusted both the slider and the color wheel for shadows, only the color wheel for the midtones, and only the slider for highlights. There’s a “gear” function at work in these wheels and sliders, so you must drag the crosshead a lot longer towards the desired color tint than the distance you want the slider or point to move. This makes accurate adjustments a breeze, even though the wheels are small on the screen. Press Shift while you’re dragging to make them move faster. You can also just click where you want the crosshair to be, and then drag it to tweak it further. If you’re using a control surface, the wheels and knobs there will adjust the wheels and sliders in this section. A great thing about using a control surface is that you don’t need to activate the Lumetri Color panel. Just place the playhead over the clip and start adjusting. Like in the Basic Correction section, the HDR White slider is inactive until you choose High Dynamic Range in the panel menu. This section lets you create interesting looks, make your viewers focus on the right parts of the image, and so on. You can select pixels within a selected range of hue, saturation, and lightness and adjust only those pixels. You’re actually making a mask that is defined by a color key, if that helps you understand what is going on—if not, don’t worry. I’ll explain further. This where you can fix a skin tone after adding a teal tint, make a dress or a logo stand out from the rest of the image, and so on. You can also hit the Invert Mask button to invert the selection and adjust all other pixels instead, preserving the selected ones as they are. Let’s make the yellow color of the house in this shot pop a bit more. To do the initial section you can click one of the colored buttons or use the left eye dropper. Then you can use the plus and minus eye droppers to add and remove pixels from the section. This is the result after I Ctrl-clicked with the eyedropper on the yellow house and set the key view to color and black. Like with the White Balance eyedropper, you can press Ctrl (Cmd) to get a bigger eye dropper that samples the average of 5×5 pixels. To see what pixels are selected you can choose to see white/black, color/black or color/gray. What mask view that best shows your selected pixels will depend on the footage. In my case, the yellow color showed up best against black. Dragging the sliders in the Key section, I was able to make a better selection. Then I adjusted the wheels for shadows and midtones towards orange and lowered the midtone levels. After you’ve picked the colors you want to change with the eyedroppers, you can adjust the sliders (Hue, Saturation and Levels) to select a wider or narrower range of pixel values. You drag the triangle on top of each slider to adjust the range, and the bottom triangle to make the transition between selected and non-selected pixels smoother. Use the Denoise slider to get rid of any small specks in the key mask. You can also drag the Blur slider a tiny bit to soften the mask if the edges get a bit harsh. Watch the mask view closely while dragging the sliders. The settings I ended up using for this shot, and the final result. Before and after adjusting the yellows to be more orange and more saturated. Instead of doing the key on the original footage, the HSL Secondaries key in Lumetri is looking at the pixels after the sections above it. So, if you tweak the color in the sections above the HSL Secondaries in the same Lumetri effect, or on the Master Clip, the HSL keys are affected. If you decide to increase the exposure or cool down the clip after you’ve adjusted the key, all the HSL keying must be done again. In my opinion, HSL keying should be done pre-effects—at the very latest immediately after the Input LUT. Changing the color, sharpness, and so on should not affect the key and should always work based on the original pixels. In the Vignette section you’ll find sliders for the amount of darkness or lightness the vignette should have, the midpoint, the roundness and the feathering. Add vignettes with the Vignette section. Although I do sometimes use vignettes, I don’t use the Vignette section in Lumetri much. There are no choices for blending modes, and the vignette is always centered. So, I roll my own vignettes using adjustment layers with masks and blending modes instead. The wheels get filled when they’re adjusted, and their sliders get a blue color. This way, you always know what’s been adjusted and not. The Lumetri Color wheels give you visual feedback. Shadows wheel and slider are untouched. For the Midtones, only the slider has been touched. For Highlights, both the slider and the wheel have been adjusted. Other sliders often have their default value at the center position, or at the far left. Again, this makes it easy to see what’s been adjusted. It’s pretty obvious that only the Exposure and Whites sliders have been touched here. You can reset each slider, wheel, and curve in the Lumetri Color panel by double-clicking on them. This method doesn’t work in the Effect Controls panel, but in that panel, every parameter has its own Reset button. There’s no lack of Reset buttons in the Effect Controls panel. The upper one resets the whole Lumetri Color effect. The lower one resets the parameters in the Tone section only. All the other ones reset individual parameters. Now that we’ve gotten to know the tools a bit, let’s take look at how you should attack a color-grading session. This common workflow makes grading faster, simply by minimizing the number of times you need to re-adjust any parameters. Source Settings for all RAW formats are found in the Effect Controls panel under the Master tab. The settings available for the different formats vary a lot, from the incredibly detailed settings for RED RAW to the very limited settings for Sony RAW. If your footage is not RAW, you can jump straight to the next section and find your hero shot. The idea of Source Settings is to get the levels within a workable range and somewhat normal-looking before you start the actual grading. Adjustments you do in the Source Settings are not adding to the CPU or GPU load, and you’re using the full bit depth of the file. You can also apply source settings to multiple selected clips in the Project panel. Select the clips and right-click and choose Source Settings or click Clip > Source Settings. Add same source settings to multiple files in the bin. If Source Settings is grayed out, you must select Disable Masterclip Effects in the right-click menu to make the Source Settings option available. Set the black levels while watching your RGB Parade scope. If necessary, adjust the RGB balance to make them neutral. My favorite tool for this is the RGB Curves. Set the white levels the same way. Set the gamma, meaning you’ll adjust shadows, highlights and midtones. This is mostly done by eye, although you may want to get skin tones in the right range etc. Tweak memory colors like skin tone, foliage and grass, sky, etc. with secondaries. Use secondaries and masks to adjust important colors on logos, props, costumes etc. When the hero shot is done, you can start matching the other shots to it in Comparison View. You can do this manually or use the Match feature in Lumetri Color panel. Both are explained in detail below. When the shots are all looking good, it’s time for adding that creative look. I prefer to use an Adjustment layer for this, placing it on a track above all the clips. It may be necessary to do individual tweaks to some clips after adding the adjustment layer. If you’re delivering to broadcast, streaming services or cinema, you’ll have to keep your video levels within legal range. But even if you’re outputting to YouTube or other places on the internet, or a file to be played locally on a computer, you should keep your levels within certain limits. Levels above 100 IRE will generally not show on a computer monitor and will just show as white. To make sure your levels are within range, add an adjustment layer above everything else and apply the Video Limiter effect to it. The new Video Limiter effect we got in version 12.1 is much better than the old one and also has a gamut warning feature. It includes a small range of meaningful presets, combined with good image processing under the hood. By default, the Video Limiter will just clip the whites and cut the saturation at the levels dictated by the Clip Level settings. Use this as a safety net after grading. Do not rely on this effect to take care of your levels. You’ll get much better results if you grade your clips properly, getting them within range, and then add the Video Limiter to take care of any small mistakes you’ve made. Just so you don’t get the project kicked back from the broadcaster. I chose the EBU preset, since I’m based in Europe. If you turn on the Gamut Warning, you can see what pixels the Video Limiter has affected. Now that you know that the levels are out of gamut, you can grade the clip to make it adhere to the standards. The Gamut Warning clearly shows what parts of the image are out of range. In this case, I just need to lower the whites. After lowering the whites with a Curves adjustment, very few pixels are clipped by the Video Limiter. I’m fine with those pixels getting clipped. If the clipping is a bit harsh, you can tell the Video Limiter effect to compress the highlights before clipping. I generally don’t use this option, as I like to get my shots legal by manual tweaking. Compression settings in the Video Limiter. The higher you set the compression, the more of the image will be compressed. With compression on, a lot more pixels are affected. When you use Compression before clipping, the color overlay shows what parts of the image has been compressed and clipped to get them into legal range. Not all of the colored sections are too bright, but the limiter is reaching back into the almost-too-bright range in order make the transition smooth. I use the Video Limiter set to clip at 100 IRE and turn on the Gamut Warning when I grade video that will be watched on a computer or on YouTube or other social media. Since levels above 100 IRE will be clipped on most computer monitors, I like to know what pixels they will not see and make manual adjustments, so they get within visual range. Setting Clip Level to 100 IRE shows me what pixels will be clipped on a computer monitor. A manual adjustment will fix this. As you’ve seen, the Video Limiter is a great tool for colorists. Do remember to switch the Gamut Warning off before you export, though—it will show on your exported video! While Resolve uses the fancy term “Power Window”, in Premiere Pro it’s just a Mask—a method for targeting your effects to an isolated part of the image. The way they’re used is the same. There’s no Masks section inside the Lumetri panel, but that doesn’t mean we can’t use masks. In the Effect Controls panel, you can create an ellipse, rectangle, and free-draw Bezier masks as on any other effect. In my shot, I didn’t want the yellow objects to the right to be affected by the adjustment I did to change the yellow color of the house. So, I clicked the Pen icon under the name of the effect in the Effect Controls panel and drew a mask around the house. Make a mask on the Lumetri Color effect to limit the adjustment to certain areas of the image. Now only the pixels inside the mask are affected. I could also have made a mask around the other yellow objects and inverted the mask by checking the Inverted box. If it’s a moving shot or a moving object, you can also use the mask tracking buttons to make the mask track the object. Combined with the HSL Secondaries and other sections of Lumetri, the masks are very useful for color grading. Heavily feathered masks are used a lot to lighten and darken certain areas to focus the viewer’s attention where we want it. If you add more than one Lumetri Color effect, they appear below the first one in the Effect Controls panel, and the Color panel will switch to only adjust the parameters for the last instance. You cannot get it to select other instances. Only the last instance (oh-so-cleverly named “Second”) is affected. The instance named “First” has not changed. Unfortunately, there’s no indication in the Lumetri Color panel that shows what instance of the effect you’re remote controlling, but now you know. To operate more than one instance of Lumetri, you must use the Effects Controls panel and operate the controls there. I like to keep my Effect Controls panel docked with the Lumetri Color panel to make it tall. This docking also makes switching between the panels really quick and easy. Docking the Lumetri Color panel and the Effect Controls panel together lets you easily switch between them. You can adjust one instance (again, always the last one) in the Lumetri Color panel and a second instance in the Effect Controls panel, so you don’t have to scroll up and down in the Effect Controls panel. Just use keyboard shortcuts to switch between the panels. The default keyboard shortcut is Shift+5 for the Effect Controls panel, but the Lumetri Color panel doesn’t have a keyboard shortcut in the standard keyboard layout. I’ve set mine to F5 for the Effect Controls panel and F6 for the Lumetri Color panel. Typically, these are set to Capture and Batch Capture, but when was the last time you captured from tape? I’ve also set the keyboard shortcut for the Lumetri Scopes panel to F7. I use my F5-F7 keys to switch between Effect Controls, Lumetri Color and Lumetri Scopes. I highly recommend that you assign a one-button shortcut to Bypass Lumetri Color Effects, for easy toggling between your grade and the original footage. I’ve assigned the Asterisk (*) button on my Numeric keyboard for this, so I can quickly compare the look before and after the tweaks. Pressing the key will switch off all instances of Lumetri Color on the selected clip for as long as you keep the key pressed. When you release the key, all the Lumetri Color effects on the clip are switched on again. Nice! Note that this keyboard shortcut only works when the Lumetri Color panel is active. There is an fx button at the very top of the Lumetri Color panel, to the left of the Reset button. This button toggles the Lumetri Color effect on and off. But since the Lumetri Color panel only works on the last instance of Lumetri Color, it will only turn off one Lumetri Color effect when you have several stacked on the same clip. The keyboard shortcut for Bypass Lumetri Color Effects, will turn off all instances of the Lumetri Color effect. It’s nice to have both options. The fx button in the Lumetri Color panel only turns of the last instance of the effect. Use the fx buttons in the Effect Controls panel to toggle Lumetri on/off if you work with the Lumetri Color panel closed. You can also assign a keyboard shortcut to the Global FX Mute feature. This disables all the effects on all clips (excluding fixed effects like Motion, Opacity, etc.) Toggling the effects off does not affect the export, just your previews. This is nice when you want to see the clip before and after all effects and color grading. It’s also great when your system struggles to play back the timeline. Just hit the shortcut, do your edit changes with no effects, and hit the shortcut again to see the final piece. It only works when the program monitor is active, which can cause some confusion. You can also add the fx button to the Transport Controls area under the monitor. I always hide the Transport Controls to get more space on my screen, so I use the keyboard shortcut. You can turn the Transport Controls on and off in the Program Monitor’s Settings menu – the wrench icon. You can add the Global FX Mute button to the Transport Controls in the Program Monitor. Hit the + button to add it if you don’t already have it there. Sliders may not show the full range of values available. Some sliders stop at 100, but you can manually enter numbers, or drag the blue digits, to a higher number. So if the sliders won’t let you go far enough, start dragging the blue numbers. Sometimes, dragging the numbers will let you set values higher than the sliders will go. The WB slider goes to 100, but you can manually set it all the way up to 300. Be aware that showing the Lumetri Scopes panel will cause Premiere to use more computer resources (GPU and CPU) since the signal needs to be processed twice—once for the Program Monitor and once for the Lumetri Scopes panel. I did a test where I added Lumetri Color to an adjustment layer and played the timeline for one minute. During the first half, I only had the Program Monitor open, and kept the Lumetri Scopes panel hidden. For the second half, I brought the Lumetri Scopes panel to the front to activate it. Throughout, I measured the GPU Load and the CPU Usage. The results can be seen in the figures below. The GPU Load went from around 40% to roughly 50% when I activated the Lumetri Scopes panel. CPU Usage also doubles (going from below 20% to 40%) when the Lumetri Scopes panel is open. So to keep your system running smoothly, close or hide the Lumetri Scopes panel when you don’t need it. As I mentioned earlier, you can save presets in Lumetri Color. I love Lumetri Color presets! If you want to explore my presets, you can download them for free. There are more than 100 presets in version 4.0 of Jarle’s Presets, and they include the Handheld Camera presets used by the editors of the Deadpool movie! Unfortunately, the Lumetri Color panel is hugely mouse-driven. There are very few keyboard shortcuts available, and they mostly reflect the panel menu settings. Not much to see here, unfortunately. Let’s hope we get more keyboard shortcuts for Lumetri Color (and scopes) in the future. These are my settings, not the default ones. If you use a control surface to drive Lumetri, it will of course be much less mouse-driven. I highly recommend that you buy a control surface if you do a lot of grading in Premiere. The Lumetri Color panel doesn’t even have to be open or active to use the control panel, which is fantastic! The clip you want to adjust to has to be selected, of course. It can’t read your mind (yet). This feature enables a great workflow. During editing, when you want to tweak a clip, you simply start rolling the wheels and turning the knobs. Then you go back to editing. Pretty neat! So what control panels will work? Any Tangent panel supported by the Tangent Hub software will work, including Tangent Elements, Wave, and Ripple. Besides Tangent hardware, you can also use the Palette controller for Lumetri. 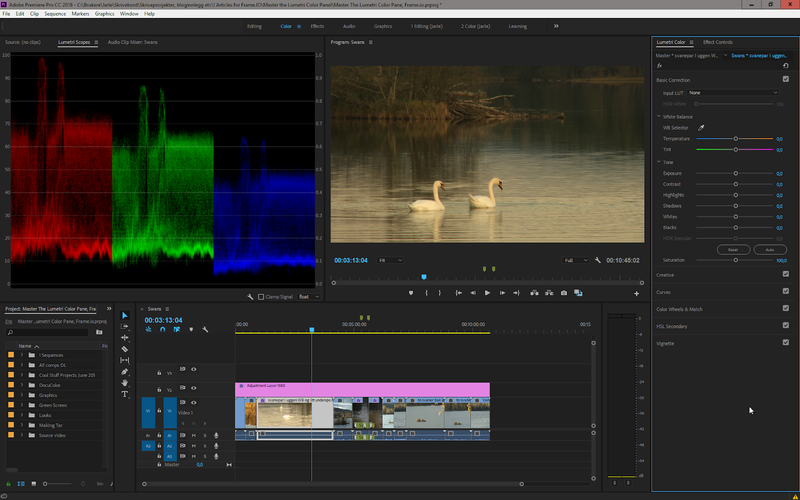 In the spring 2018 version of Premiere, Adobe introduced Comparison View in the Program Monitor, featuring both shot and frame comparison. This is a nice addition, so we don’t have to load the sequence into the Reference Monitor and the Source Monitor to compare shots. Even though After Effects has both Lumetri Scopes and the Lumetri Color effect, this feature is available only in Premiere Pro. The Comparison View offers three different ways to compare shots and frames. Vertical, side-by-side and horizontal. You can get into and out of Comparison View in a few different ways. The most obvious one is to click the new Comparison View button in the Transport controls, located in the lower right-hand portion of the Program Monitor. If it’s not there, click the big + sign to add it. The Comparison View button in the Program Monitor. You’ll also find a Comparison View button in the Color Wheels & Match section of the Lumetri Color panel. The Comparison View button in the Lumetri Color panel. If, like me, you’re hiding the Transport Controls in the Program Monitor because you use keyboard shortcuts for all its features, you can assign a keyboard shortcut for toggling Comparison View, although only to activate it, not to change between the view options. I’ve assigned Comparison View to my F8 key. I’ve used F8 for toggling Comparison View on and off. Unfortunately, this keyboard shortcut only works when the Program Monitor is the active panel, which seems like an oversight, since you’ll probably be working in the timeline, the Effect Controls panel or the Lumetri Color panel when you want to compare shots. Let’s hope this changes in future versions. Finally, you can enter Comparison View from the wrench menu in the Program Monitor, but I can’t see why anyone would want that. The most common use of the Comparison View is to match different shots, and it’s also the most intuitive way to use it. Shot Comparison View, before any adjustments. Figure 36. Shot Comparison View made the manual shot matching easy. I use the side-by-side comparison a lot, and only switch to vertical and horizontal split view when I’m in doubt. But especially for matching skin tones, the two split views are very handy. Drag the division line in vertical split view to compare skin tones and other important colors. The horizontal split view may work best on some images. The Lumetri Scopes reflects the view in comparison mode, so you can see the two shots side by side. This is especially useful with waveform scopes in vertical split view. Vertical split view clearly shows that the image on the right has a lot more blue and a bit more green than the one on the left. The shots are nicely matched, using Curves. The slider on the reference side is of course a playhead, so you can use any reference frame you want. You can also click the forward or backward arrows to go through your clips and find the perfect reference frame. Use the arrows to jump to previous or next edit point. Use the slider to access any frame. This is quite intuitive and works fine for short timelines. In longer timelines with lots of cuts, it’s not accurate enough for my taste. Oh, well—it’s version 1.0 of the Comparison View, so it may improve in later versions. A different colored playhead in the main timeline would be great. There are two buttons in the Comparison View that are easy to miss—the Shot or Frame Comparison button on the left, and the Swap Sides button on the right. Most people see the buttons in the middle, but the two on the sides are often overlooked. They are the Shot Comparsion and Swap Sides buttons, respectively. The Swap Sides button does exactly what you’d expect: It swaps sides, so you can have the reference frame on the right, and the current frame on the left. My brain is wired so that the result should be on the right, so I tend to keep it at the default setting. But swapping sides can be useful in split view, so you can see the opposite side of the two frames. Click the Swap Sides button to swap the images and the reference timeline slider. When you switch to Frame Comparison mode by clicking the Shot or Frame Comparison button, you get the same image on both sides. In Frame Comparison mode, you see the image before and after your adjustments. The “before” shot will stay in the buffer until you click out of Frame Comparison mode. When you enter this mode again, Premiere loads a new “before” image into the buffer. So, if you click in the timeline, or switch to Shot Comparison mode, and then go back to Frame Comparison, you will see the same image on both sides. The tweaks we did before are now shown as the “before” image. So any changes you do now will be compared to how the image looked immediately before you entered the Frame Comparison mode the last time—not to the original image. The Current state in Comparison view is not the original state. Any adjustments are compared to the earlier adjustments we’ve made. To trick Premiere into showing you the original image, toggle the Lumetri effect off by clicking the fx button in the upper left corner of the Lumetri Color panel and then exit Frame Comparison mode. Then enable Frame Comparison mode again to load the untouched image into the “before” buffer. Now you can re-enable the Lumetri Color effect and compare your adjustments to the original, untouched image. By temporarily disabling the Lumetri Color effect before entering Frame Comparison mode, we can compare our color tweaks to the original image. Comparison View is great when you’re matching shots manually, but the spring 2018 version of Premiere also introduced Color Match, which can give you a head start. Color Match is powered by Adobe Sensei, which is an example of Adobe’s machine learning technology (it’s also the power behind other features like Content Aware Fill in Photoshop, automatic music ducking in Premiere, or Facial Recognition in Lightroom). It can use Face Detection to prioritize the skin tones over the other parts of the image. If there is more than one face, the face detection will focus on the one closest to the camera. Machine learning can easily read black and white levels, but the midtones are a challenge. So, often you’ll only need to adjust the midtones after matching. Saturation is not adjusted by Color Match, so it will not work well with oversaturated images. Make sure you get the saturation of oversaturated images into legal levels before you do the match. These three shots, shot on an iPhone, need some serious shot matching. The colors vary all over the place. Let’s see what Adobe Sensei can do with them. These three shots need to be matched. In Comparison View, park the playhead over the hero shot, and move the playhead in the timeline to show the shot you want to match to the hero shot. I’ve decided that the left shot should be my reference, my hero shot. I clicked the Apply Match button, and this is the result. That helped a lot. What’s great is that even though the process is done by Adobe Sensei magic in the background, it’s still transparent. You can see what changes the machine learning did in the Color Wheels & Match section of the Lumetri Color panel, where all its adjustments are done. In this case the match is not bad, but it’s not perfect either. But we can tweak it further manually. Some additional tweaks in the Curves section made the match perfect. Now let’s see what Color Match can do with the other shot. The other shot, before any adjustments. The shot after clicking the Apply Match button. That’s not good at all! So, what’s going on here? The highlights areas in the hero image are the clouds and the sky. The highlights in the other shot are some sticks and stones on the ground. Let’s try to help the Color Match by temporarily taking away the sky in the hero shot. I do this by adjusting Scale and Position for that clip it in the Effect Controls panel. Now we’re comparing apples to apples, and Adobe Sensei should have a better chance. That’s a lot better. But I still want to tweak the result a bit more manually. With a few extra manual tweaks, the match is better. Yes, I swapped the shots in the image above. It eases the manual comparison when the levels on the left and right of the frame are different. If you want to see shots both before and after the hero shot, you can open the Reference Monitor (Window > Reference Monitor) and scrub its timeline until you see the desired shot. All the shots now have similar colors and contrast. You could also load the sequence into the Source Monitor to get four monitors, all with different shots. Looking at these shots, I found that there was a bit too much saturation, and the scopes confirmed that. Rather than adjusting each clip again, I used an Adjustment Layer on top of all the clips, with just two small tweaks: I lowered the whites and reduced saturation. All three shots, after applying a correction to the adjustment layer. As you can see, the Color Match feature isn’t perfect, but it gets you very close to a finished result. And sometimes it’s spot-on. If you get the exposure into the ballpark before matching, this can increase accuracy. Be aware that Color Match may reset your settings in the HSL Secondary section. The scopes behave as you’d expect in Comparison mode. In essence, they reflect what you see in the Program Monitor. In Side by side view, the scopes show the full width of both images, side by side. In Vertical Split view, the scopes show the split view, exactly the same as you see in the viewer. The scopes aren’t always quite as meaningful in Horizontal Split view. In Horizontal Split mode, the scopes show the full image, but there’s no visual split in the scopes. But when you start adjusting sliders and color wheels, you will see if the before and after levels are aligned or not. Comparison view is also very useful for other things than color grading. If you’re adjusting things in the Effect Controls panel or editing Motion Graphics Templates in the Essential Graphics panel, you can load the frame, including the state of all applied effects, into Comparison View before you start tweaking. Figure 64. Comparison View lets you see changes to other things than color correction. Before I explain how Premiere uses LUTs, here’s a quick primer on what they do. You can think of a LUT (look-up table) as a locked color grading preset. The difference between using a LUT and using a Lumetri Color effect preset is that the LUT can’t be adjusted apart from the intensity, and you can’t see what parameters it has changed. There are two main types of LUTs: technical LUTs and creative LUTs. A technical LUT is often used to bring Log footage from a certain camera into a proper video color space (Rec. 709) with correct levels and contrast. In Premiere Pro, these are called Input LUTs, and you add them to your footage using the Input LUT drop-down menu in the Basic Section of the Lumetri Color panel. Figure 65. Log footage from an Arri Alexa camera before adding a technical LUT. Footage courtesy of Arri. Figure 66. After adding the Arri LogC to Rec. 709 LUT, the image looks normal. Note that I added the Input LUT to the Master clip. This means it will already have the LUT applied when I put it in the timeline. You can download technical LUTs from the web sites of the camera makers, like Sony, Arri, Panasonic, Canon, etc. Figure 67. Here I’ve added the look named SL Blue Ice. It has added contrast and made neutral shadows, midtones and highlights bluer while keeping the whites neutral and at the same time. You can find creative LUTs all over the internet. Websites that deal with color grading are full of them, both free and paid ones. Some colorists recommend that you apply the input LUT on an adjustment layer and do your other adjustments on the clips below. I do not recommend this. The controls in Lumetri are expecting standard gamma, not Log, and adjustments will be very difficult because the controls will not work in the range they’re made for. And remember that creative LUTs will not magically make your footage look good. LUTs are calibrated for correctly white balanced images. They expect an image with standard levels, contrast and saturation. Throwing a LUT on a badly exposed shot or a shot with a color cast will not give you a good result. You must balance your shots before you apply creative LUTs. In older versions, some clever editors found a way to make their custom LUTs appear in the drop-down menus for convenience. This involved tampering with the LUTs within the application package, and it resulted in all kinds of problems when editors worked on several systems, when several editors collaborated, and when they exported via Adobe Media Encoder. This is why we got the Lumetri Color custom LUT directory in the spring 2018 version. You can now install custom LUT files which will appear in the Basic Correction > Input LUT and Creative > Look drop-down menus. To install a custom LUT file, first create one or more of the directories listed below as follows: Create a folder named LUTs, then create two more folders inside the LUTs folder: Technical and Creative. Now copy your custom technical LUTs into the Technical folder, and your creative LUTs into the Creative folder. After Effects, Premiere Pro and Adobe Media Encoder will scan these folders at launch and load LUT files from these directories. So, to see the changes, you’ll need to restart Premiere Pro. Your LUTs now show up in the drop-down menus. This will persist through updates unless you delete or change these directories. If you want the LUTs to be available only to the local user, use the following folders instead. On a shared storage facility, you may want to talk to the IT people and make them auto-sync the folders between edit bays regularly. When you need to add a technical LUT (Input LUT) to a lot of clips, you don’t want to use the Input LUT drop-down menu, because the Lumetri Color panel only works on one clip at the time. Instead, add make a Lumetri Color preset, where you’ve only applied the LUT. Figure 68. 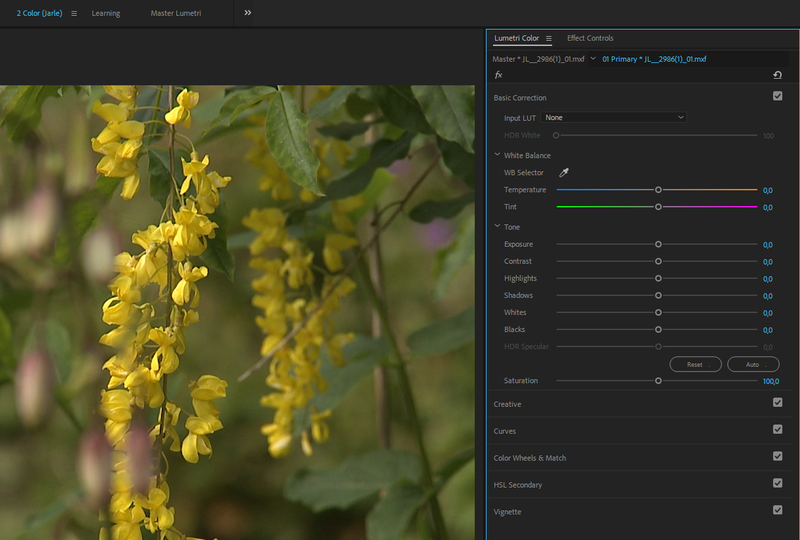 Add the LUT and export a Lumetri Color preset via the panel menu. Then select all the clips in your bin and drag the preset to one of them. Now all your clips have the Input LUT applied as a Master Clip Effect. Figure 69. Select all the clips in the bin and drag your LUT preset to them. Figure 70. The red lines under the fx badges on the clips in the timeline show that a Master clip effect has been added. If you want to temporarily disable the Master Clip effects, select the clips in a bin, right-click, and choose Disable Masterclip Effects. Be warned, though—you will have to re-enable them manually on each clip one by one; there is no way to re-enable them all in one go. Figure 71. You can disable Masterclip Effects on multiple clips. There’s also no indication in the timeline that the Master Clip effects have been disabled—the red lines are still there. You’ll have to re-enable them by checking the little fx icon in the Master tab in the Effect Controls panel or at the top of Master tab in the Lumetri Color panel. Arri Amira cameras can be set to add LUTs to the source footage, and these are automatically applied as a Master Clip effect in Premiere. These Amira LUTs are huge, and are known to cause project bloat, which can slow down the project and even cause instability and crashes. The .cube format seems to be the most widely supported one, so I recommend that you export all your LUTs in that format. Figure 72. Export LUTs for use in any NLE or color grading software. If you want to see the settings used in your looks, save your adjustments as Lumetri presets instead, using the Save Preset choice in the panel menu. The sliders and wheels will then reflect how the Look was achieved, but the preset will only work in Premiere, unlike a LUT which can work in most software. The Auto-Refresh LUT/Look feature in the Lumetri Color panel menu will force the looks and LUTs to be updated every time you open a project. This means you (or your colorist) can modify the LUT on your disk, and the changes will automatically apply the next time you open the project. In our last section, I will cover some technical details you need to know about the panel in order to avoid some common mistakes. This knowledge enables you to take full advantage of the panel and be sure that you understand exactly how your images will be processed by Lumetri. Premiere Pro uses gamma-encoded 709 throughout, which Lumetri converts to linear for internal processing, without touching the primaries, and then back to 709 Gamma before spitting it back out. It’s OK if you don’t understand what this means, since you can’t change it anyway. I just included it for the nerds. This means that your monitoring will always be in Rec. 709—the standard color space for HD TV. You can’t monitor true HDR out of Premiere. It also means that the Composite in Linear Color option in Sequence settings has no effect on Lumetri, because Lumetri is always working in linear color internally. Even though they’re placed at the bottom of the UI in the Basic Correction section of the Lumetri Panel, the Whites and Blacks sliders are applied before the other sliders! Why is this important? Because it affects how the image is processed and, consequently, how it will look. Since the Lumetri Color effect works in 32-bit floating point linear color, you may think you can adjust Exposure first, and then raise the Whites, and it will all look good. It won’t, because Lumetri handles overbrights (levels above 100 on the scope) in strange ways internally. Let me illustrate this with a linear gradient. As you can see from this image sequence, this creates a very strange curve, and introduces artifacts in the highlights of the image. I don’t know any other Color Grading effect that works this way, so be aware! Note that this is only a problem when you don’t get your levels right with the Whites and Blacks sliders first. Adjust the Whites and Blacks sliders to get the signal in the 0-100 range before you even think of adjusting anything else. The Lumetri effect is designed to help you avoid clipping in Luma and Chroma signals by introducing compression, which results in soft “knees” at the extreme highs and lows. See the figures below. Figure 08. Soft compression introduced by the Exposure slider. Signal does not go above 100. Figure 09. Soft compression introduced by the Contrast slider. Signal stays within the 0-100 range. Most of the time, this is a good thing! No matter how much you increase Exposure or Contrast, you will never create illegal levels, plus your images will look good. But it’s not the standard behavior for exposure controls in color tools from other software, so you might be surprised. Note that this soft compression also means that if you push Saturation too far, it will skew the color a bit away from the original. This may sound like a big problem, but in real life, you very seldom increase Saturation that aggressively. Your show would be rejected by Quality Control at broadcasters and streaming services if you did. As we saw in the linear gradient above, dragging the Whites above 100 and increasing the Exposure before dragging the top of the RGB Curves down, results in a distorted version of your pixel values. This is because sliders like Exposure and Contrast only work on pixel values between 0 and 100 and compress the levels when you bring them close to 0 and 100. Your overbrights are not affected by these two sliders! But since RGB Curves can handle overbrights, and comes after the Basic Correction section, you can still get those overbrights into legal range, and maybe get some surprises. As long as you know about this, it’s not a problem, but people new to Lumetri and Premiere Pro will inevitably destroy their images. Sometimes without even knowing they did. The Basic Correction section has two sliders that will affect levels above 100 and below 0—the Whites and Blacks sliders. As we’ve seen, these will let you introduce, and bring back, overbrights and super-blacks. Before version 2017.1, even these did not affect out-of-range levels, but after my complaints we can adjust overbrights from YUV formats correctly, and bring them down to 100. Just remember to do this before any other adjustments to avoid trouble. Now that you know this, you can easily avoid problems. Just start by adjusting the Whites and Blacks sliders until the signal in the Waveform scope lies safely between 0 and 100. By default, the Lumetri Color effect will cap any Exposure and Contrast adjustments at 100 percent. So, when you stack Lumetri Color effects, you will not be able to keep your overbrights intact. A partial solution is to set the Lumetri Color effect to High Dynamic Range, HDR. Some of the challenges that people have when using Lumetri is that they don’t expect the effect to use compression. There is a way to avoid some of the compression, and that’s to set the Lumetri Color effect to HDR, even though your material is not HDR. You can set this in the Effect Controls panel or in the panel menu in the Lumetri Color panel. Figure 13. Set the Lumetri Color effect to HDR to keep overbrights and avoid some compression. It’s a hassle to do this on every clip, so I recommend that you save an effect preset with this already in place. To do this, add the Lumetri Color effect to a clip and change the setting to HDR. Then, without making any other changes, go to the panel menu and click Save Preset. Throw this preset on all your clips in one go before you start grading, and your overbrights will be preserved. Figure 14. Raising the Exposure to 0.6 caused some compression. Figure 15. After setting the Lumetri Color effect to HDR, the same Exposure adjustment no longer introduces compression. Instead, the levels go above 100. It’s a good idea to always set Lumetri to HDR mode because you may be stacking Lumetri Effects without knowing it. Say you have added an Input LUT to all your clips, and then you add an Adjustment Layer above them where you control the overall look. Now every clip is affected by at least two instances of the Lumetri Color effect. OK, enough of this testing with boring grayscale gradients. How does this work when we have clips that already have overbrights? Let’s have a look. Many cameras record in a format that has some overbrights. You may wonder why you’d ever want your camera to shoot illegal levels? But this is a good thing, since you can get back some detail in slightly overexposed footage. Many formats, especially those used in Broadcast, record overbrights. Figure 16. This clip has overbrights coming straight from the camera. Let’s stack two instances of Lumetri Color with an Exposure adjustment to illustrate the problems you can run into. Figure 17. Two instances of Lumetri Color. Exposure set to 1.2 on the first, and -0.4 on the second, to get the levels below 100. Figure 18. The result of the adjustments I made in the previous imager. Note the compressed highlights in the scopes, resulting in very flat highlights, and very little detail in the white walls of the lighthouse. Now let’s set the Lumetri Color effect to HDR and try the same approach. Figure 19. Again, two instances of Lumetri Color. Exposure set to 1.2 on the first, but since I turned HDR on this time, I had to drag the Exposure down to -1.5 on the second, to get the levels below 100. Figure 20. Turning on the HDR setting in the Lumetri Color effect made a huge difference! No compression in the highlights, and we also have lots of midtones and a lot more detail in the white walls. Figure 21. With all our highlights preserved, we can tweak the image further, brightening the highlights and going for deeper shadows, without losing too much detail. If you want to keep levels far beyond 100, set the HDR White level to 1000. Beware though, that you are creating levels that are far from Broadcast Safe, so make sure you have a strategy for getting them back to legal range. Normally, you’d only use this setting when you’re stacking Lumetri Color effects, to avoid compression in the intermediate image. Also, when you change the White point to 1000, of course the Shadows slider will work on HDR shadows, which is just about the whole visible range in Standard Dynamic Range (SDR). So with this setting, your sliders will not always do what you’d expect. A more normal approach would be to set only the first instance of the Lumetri Color effect to HDR, to preserve the highlights. Then set the second instance to operate in SDR (HDR switch off), so the sliders work as expected. If you’ve made it this far, thanks, and I commend you. As you can see, there’s a lot to the Lumetri Color Panel. Adobe has done a great job adding some much-needed features and changes. 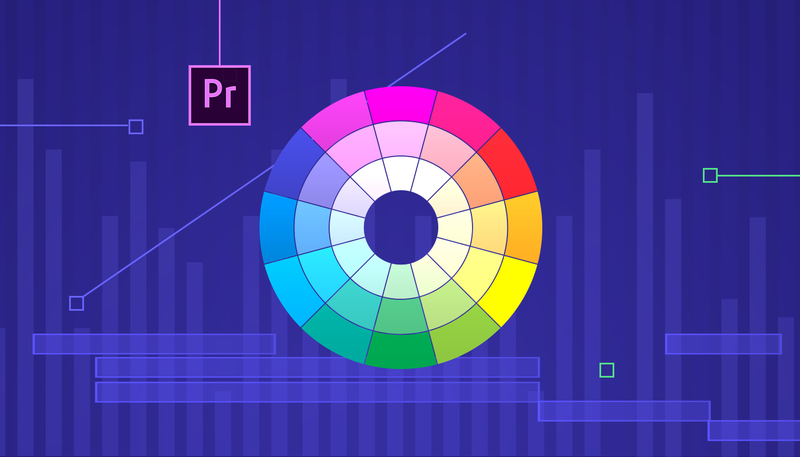 There are still a few things here and there I’d like to see adjusted, but overall, this suite of color grading tools makes Premiere a powerful all-in-one tool. Share in the comments how you use it. What are your favorite features? What would you like to see added or changed?